When it comes to designing and building the perfect lake house there are many factors at play. Perhaps the most important aspect of any project on water it to take advantage of the view. TMS Architects used the site’s natural slope to allow three stories of exceptionally detailed lakeside living. This ensured that the views would be prominent as soon as you enter the home and continue throughout all of the main gathering spaces. TMS Architects worked alongside YFI Custom Homes creating what would eventually become one of Lake Winnipesaukee’s finest homes. Details such as custom planter boxes and shutters as well as playful carved deer and diamond baluster finials are what set this particular project apart. You’ll find a seemingly endless amount of one-of-a-kind touches that have been incorporated into the final design. 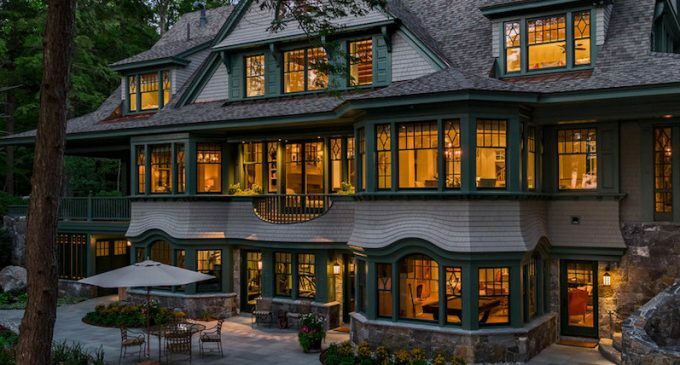 TMS Architects describes the project as having shingle style influence, incorporating gentle eyebrow flares on the bay window extensions and tapered shingle columns. Additional details include carved balusters, coffered ceilings, wainscoting, three layers of crown moulding and mahogany window sills and cabinet tops. The end result is a lake house to be proud of. If you love the building process just as much as the finished project, you can check out a series of three blog posts by YFI Custom Homes. Part one, part two and part three offer glimpses of the home in various stages of construction. We love when builders and architects reveal these images! Photography by Rob Karosis, TMS Architects and YFI Custom Homes.